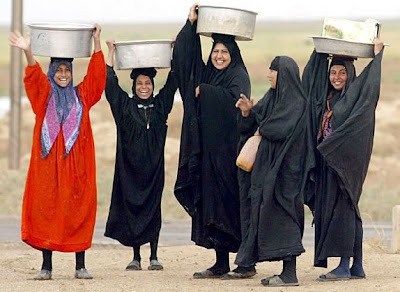 I've been putting off doing this post for a quite a while now because searching for photos to do with Iraqis is quite, um, traumatic, shall we say.. 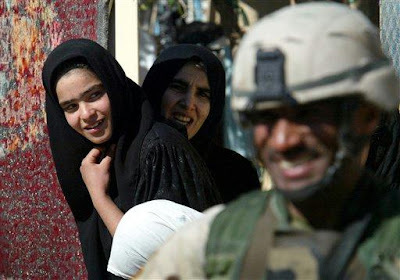 Especially when it comes to the photos graphically depicting how some of the 'hero' soldiers treat Iraqi women (and men..). Before I go off on a looong tangent in which I'll get people telling me that not all soldiers are the same and that I'm making generalized sweeping statements about the good Americans, I'll press on..
Hmm, no doubt this next cliche photo was put together but one of the invading countries.. it makes it out as though women have been liberated and can suddenly vote. 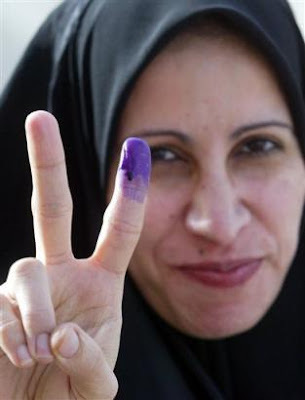 Reality check: Iraqi women were given the right to vote in 1980 - no thanks to any foreign troops that is. Who's she pointing at, I wonder.. I really dont see what you like about that university pic. Maybe reminds you of your own time at university, or something. Oh, and did you hear about the recent $1 Trillion worth of minerals that were found in Afghanistan? I wonder what they'll do with that. No, it doesn't remind me of my university lol. I just like the photo. As for the Afgan money, well it will probs go towards getting bp out of it's mess, isn't that what these wars are all about?! Thanx for posting these pictures sister. I like them. i love the last one. you can see the fighting spirit is soooo deep inside them. women with weapon? nothing weird. Only thing better than a Muslim woman in a burqa with a machine gun is a Muslim woman in a burqa that's been trained at Shaolin. I will defenitely visit again. Keep up the good job, mashaAllah! Reality Check: Women in the US won the right to vote in 1920. 1979 was the Convention of the Elimination of all forms of Discrimination Against Women that was adopted by the United Nations. This made it law, by any member of the UN that all those nations citizens (regardless of gender, ethniticity, property rights ect) had the right to vote. So consequently, member nations who did not have woman's sufferage in place prior to this convention; put it in place shortly after. 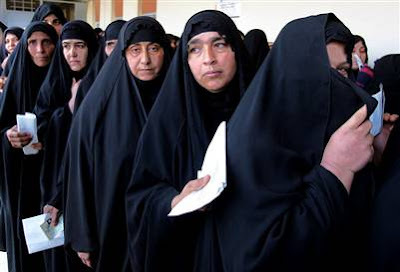 But sufferage in general was a misnomer in Iraq until Saddam was removed, because just like in most communist countries; at any given "election" there was only one person on the ticket. 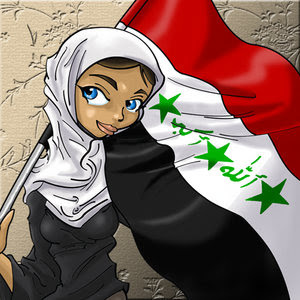 So yes, the election of the Iraqi interm government was a huge change in the political life of the Iraqi people. 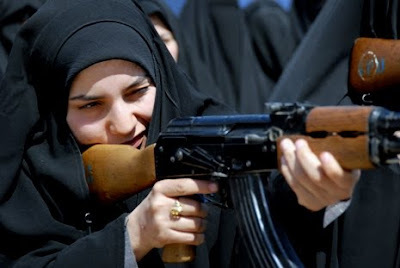 As for the weapons in the photos these women have - they are Soviet made. Most of the military hardware Iraq had / (apparently still has) came from the Soviets. Some of it came from France (just post WWII) and some of it from China. Everything with the exception of hand carried weapons was destroyed in either Desert Storm or the most recent invasion. As for the picture of the soldier in the university. I like that picture too. I'm guessing he's probably looking at the journalist(s) taking the photos.